This is right out of Save the Cat: Act 1, Act 2 Part 1, Act 2 Part 2, and Act 3. I KNOW IT ALL! MUAHAHAHAHAHA! 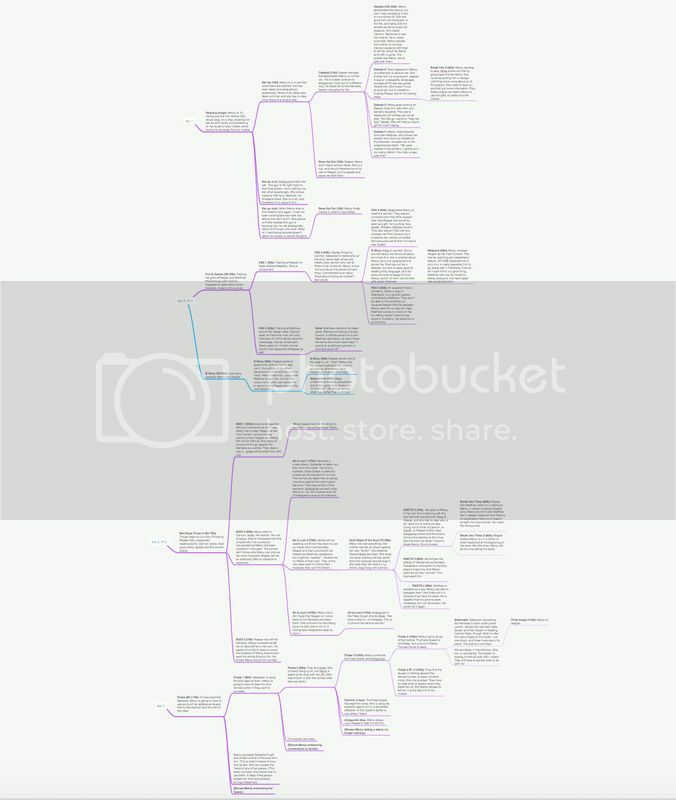 Okay, so some of the details might change as the novel is written, but the structure will remain, and I HAVE a structure, and I know the lessons Mercy must learn by the end. And I know how she gets there. I also have an actual cork board full of index cards I used to build this. But I wanted a digital one I could have with me wheresoever I am writing, and that is easily editable as needed. And here it is. Very nice! So would you recommend this book? I looked at it on Amazon and it look to be for screen writers, not novelists. Does it explain what to do if you have more than one major character who has a story arc? Yes! I think it is possibly the best book on the structure of storytelling I have ever read. While it was written by a screenplay writer for other screenplay writers, it is really about the art and structure of storytelling, and it is very easily adaptable to novels. As to more than one main character....You could do it a couple of different ways. Have an arc for each main character, or add a "B story" that includes an arc for the secondary character. There are some good blog posts by romance writers who have adapted it to fit the unique needs of the genre, which includes having two main characters. Wow, that's quite awesome. Congratulations on a huge accomplishment! Thanks! And the app is actually Mindnodes Pro, and it was well worth the $20 cost. A bit of a learning curve, but pretty handy. Muhahahaha!!! Soon I shall get to read more awesomeness.